The ultimate solution to reduce helmet vibrations on your ADV/Enduro helmet caused by the fork tunnel updraft. The nice postal lady brought my Swegotech Forkshield (Adventure Sports Version) and I had it on in less than 5 min. Bye bye brain bouncing buffeting, it does the job splendidly and I no longer feel like a hyper bobble-head !!! Silly I waited this long to pull the trigger on one. The SWEGOTECH Forkshield is the perfect solution to reduce helmet vibrations/wind buffeting. 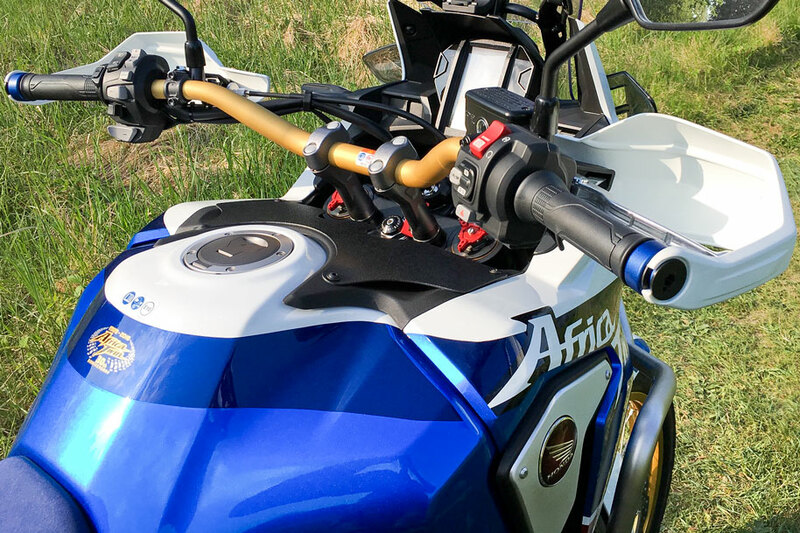 On many adventure-touring motorcycles like the amazing Honda Africa Twin Adventure Sports the upwind from the fork tunnel hits your helmet and can cause annoying and loud turbulence. Especially if you prefer to ride with a very practical and nice looking ADV helmet with a peak and flip-up visor. This forktunnel updraft will hit your dual-sport helmet peak from below. These violent upwinds can be strong enough to shake your helmet. This is not only loud and uncomfortable, but also dangerous because it can cause blurry vision, headache and even neckpain on longer motorcycle tours. Furthermore you can feel this upwind also on your shoulders/chest area and bugs and dirt can also come through the fork tunnel. So, when you find it hard to read street signs due to the vibrations on your head when driving 50mph (80Km/h) or faster, our SWEGOTECH Forkshield is the solution you are looking for. 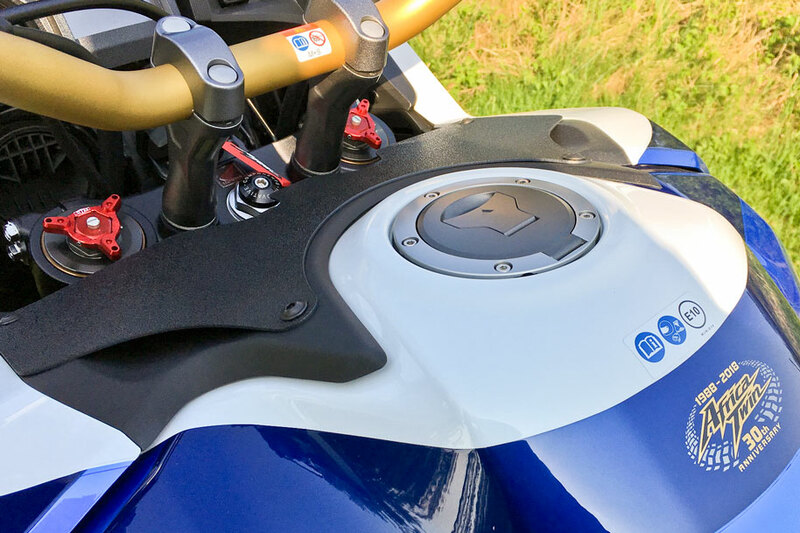 Many riders install expensive third party windscreen in the hope to reduce these helmet vibrations. In most cases it does not bring the solution these bike owners are looking for, because even the biggest windshield can only stop the wind from the front and not stop the real reason for the problem, the upwinds coming from your fork tunnel. The SWEGOTECH Forkshield works also perfect in combination with larger third party windshields. 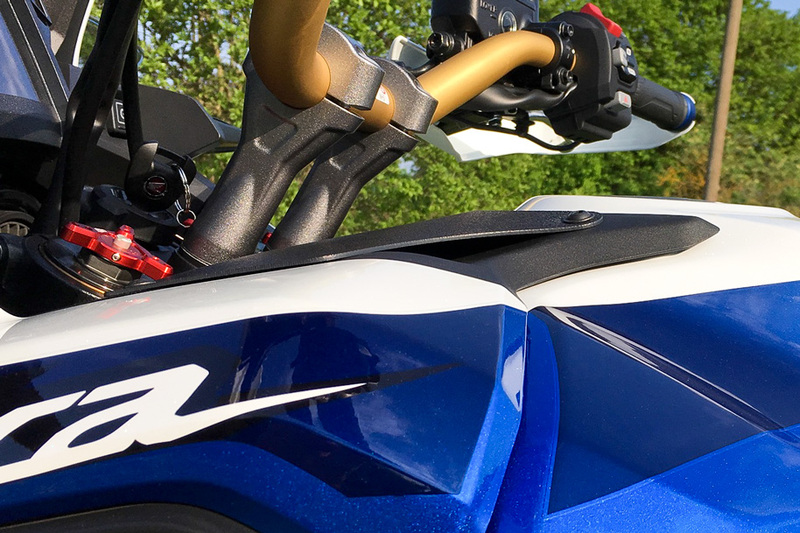 It deflects the airflow enough to help reduce the helmet vibrations, but still lets enough air through at the front of the fork tunnel to avoid a vacuum effect behind the windshield. Taller riders experience the helmet vibration problem even more often due to their higher riding position, the forktunnel wind can catch their helmet peak even easier. Also the very practical flip-front modular adventure helmets are more prone to these kind of vibrations. Usually their peak is only mounted at two points of the helmet. Helmets with stronger peaks on the other hand will cause more stress on the neck muscles. But we have the solution to fix all this! 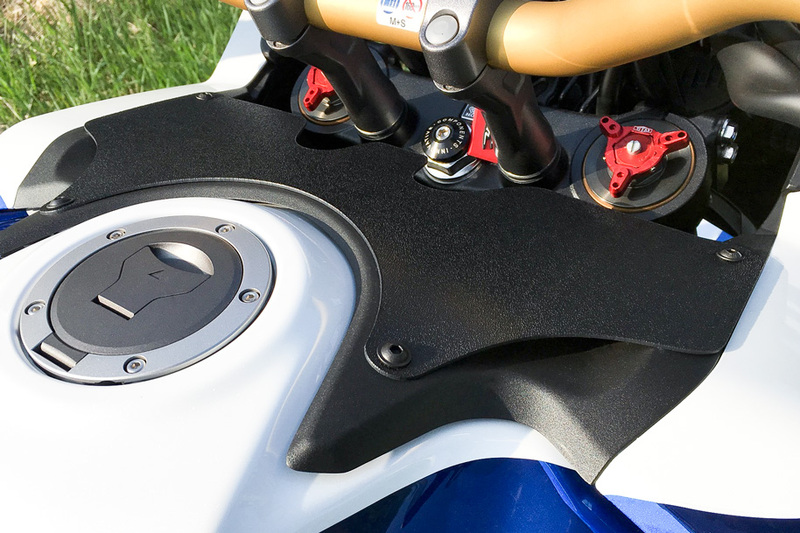 The SWEGOTECH Forkshield is an efficient, lightweight, good looking and affordable solution to reduce or even eliminate Africa Twin Adventure Sports helmet vibrations. 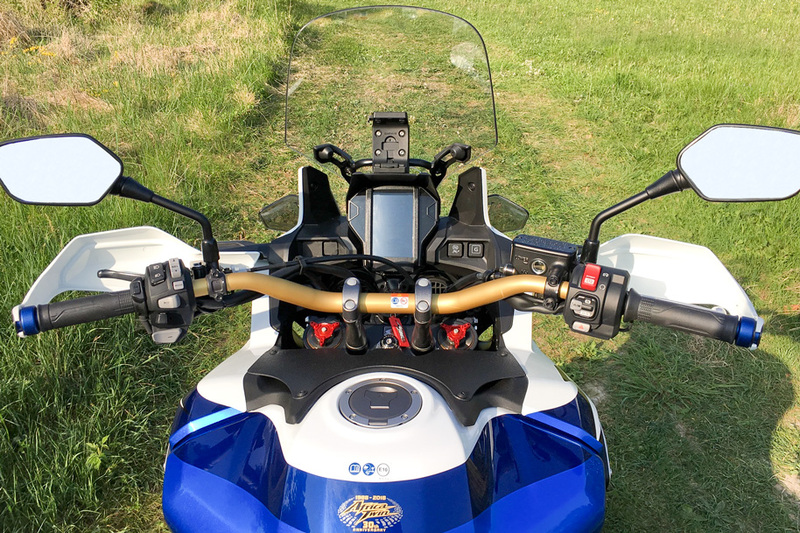 Our tests show that the rider will benefit/feel the improvement by the SWEGOTECH Forkshield technology strongest at speeds between 65mph to 90mph. To make sure that our products work, we tested our Forkshields many miles on- and offroad, with DCT and manual transmission bikes including summer rides to the Death Valley at 127F (54Celsius) in the shade, or even long high speed tests on the German Autobahn during the cold winter. So, that you can enjoy a safer and more comfortable riding experience. Shipping fees and taxes are calculated at checkout. Import duties, taxes and customs charges are not included in the item price or shipping costs. These charges are the buyer's responsibility. Please check with your country's customs office to determine what the additional costs will be. For international customers we highly recommend to buy at our eBay store, because shipping is faster, cheaper and for many countries Ebay takes directly care of all import duties and taxes during checkout. The deflector is quick and easy to install (about 5 minutes) without drilling any holes into your bike. 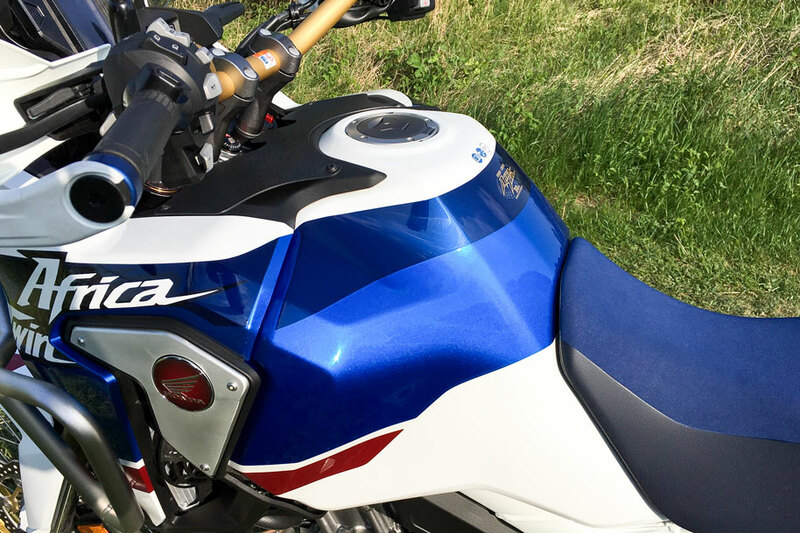 Your fork tunnel wind guard is an AMAZING improvement on my 2019 Africa Twin Adventure Sports DTC. Holy cow what a difference. This is, by far, the best money I've ever spent on an aftermarket part for a motorcycle. Amazing value. Amazing results! I've been riding with this Forkshield for three days now and I gotta say it's a GAME CHANGER on this Africa Twin... The noise was so annoying and irritating... A SWEGOTECH Forkshield is the answer to this Buffeting Noise... I am not hearing that whap-whap noise that I was getting before I installed this Forkshield... As you saw in the installation video just four screws to remove and replace and that's it... The risers still have a 100% movement for functionality... Super, super simple, it looks really good, it's well made, it does the job and comes with all the hardware you need. So for 40 bucks I don't think you can go wrong! I bought a Swegotech Forkshield (Adventure Sports Version) and it completely eliminates the buffeting of my helmet. Went for a ride last night with my son, and we did about 100 miles, some of which was on interstate and I now have smooth vision at all speeds. Bin 1,91 m und fahre auf meiner ATAS - Originalsitzbank in hoher Position, Original Scheibe - einen UVEX Enduro Helm mit Windschild. Nachdem auch ich mit Vibrationen am Helm zu kämpfen hatte, habe ich die Woche einen Swegotech Forkshield für die Adventure Sports installiert und diesen gestern Probe gefahren. Funktioniert echt prima - Vibrationen am Helm sind weg und ich kann problemlos bis 120 km/h mit offenem Visier fahren. Mine works great on my ATAS. 6'0", seat in high or low position, and Arai XD4 helmet. 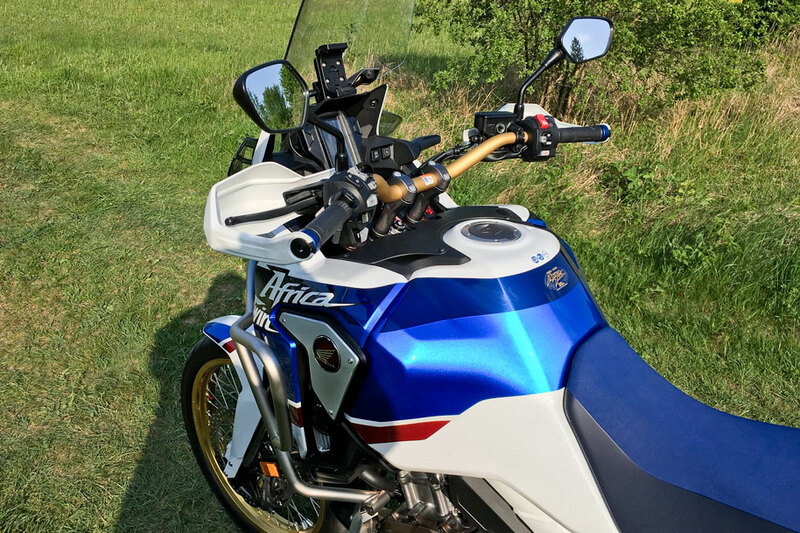 This amazing product completely transformed the ride of my 2018 Africa Twin Adventure Sports!! My bike went from unrideable at speeds over 40mph due to helmet vibration to smooth as silk. BUY THIS PRODUCT IMMEDIATELY!! It’s that good!!! Guys have spends 100’s of dollars trying to solve the AT’s terrible buffeting, this $40 product completely eliminated it for me! Easy to install, looks factory and fast shipping. Fit ATAS perfectly, looks good, 80% less buffeting on highway for me. Worth it! SWEGOTECH offers innovative high quality motorcycle accessories and solutions for a better riding experience. © 2017-2019 swegotech.com --- ® All trademarks or brandnames are in the ownership of their owners and are only used for description purposes.